Welcome to TechRadar's Shadow of the Tomb Raider Review: how did the final part in Lara's rebooted trilogy hold up? High emotions, high stakes, high ledges – Shadow of the Tomb Raider ties up a three-game story arc that looked to reinvent one of the most influential characters in video game history, without ditching everything that actually made the Tomb Raider series fun. Crystal Dynamics’ 2013 Tomb Raider reboot put Lara Croft back to square one, with none of the cool confidence we’d come to expect of the character. This was a capable, yet vulnerable explorer doing her best just to survive, let alone save the world from evil paramilitary organizations - though she naturally ended up doing both. Three years after a follow-up sequel, Shadow of the the Tomb Raider (PS4, Xbox One, and PC) sends Lara to Latin America in pursuit of a Mayan artifact hunted by her late father. Cue plenty of tombs, some big realizations about her family’s past, and a genuine Mayan apocalypse to boot. The end of the trilogy is as concerned about Lara’s personal growth as it is the natural disasters afflicting the places she visits – Mexico, Peru, and the lost Incan city of Paititi – but with some terrific platforming and a host of new traversal mechanics shaking things up. Shadow of the Tomb Raider was intended as the game where Lara ‘becomes the Tomb Raider she was meant to be’, and her skillset has been upgraded accordingly. So how did it play? Having ploughed through the roughly 12-hour campaign, we can confirm this is an end befitting of its predecessors, albeit with some of the same mistakes carried through. Read on for our full Shadow of the Tomb Raider review. From the outset of Shadow of the Tomb Raider, you’re attempting to evade and outwit the power-hungry Trinity organization and its charismatic leader Dominguez, chased through a number of Mayan and Incan ruins in classic Tomb Raider style. Camilla Luddington is back as Lara, with stellar voice work from both her and returning co-star Earl Baylon, who plays her loyal companion Jonah. Their relationship is a real bedrock to the action, and provides plenty of emotional heft in the game’s recurring cutscenes. Shadow of the Tomb Raider is explicitly ‘cinematic’, to the point where it doesn’t always tell you whether you should still be pressing buttons or just watching the action unfold. But the animation is winningly realistic, from the crumbling stone cliffs to the coiled muscles of the jaguars hunting you in the jungle, and you’ll be in awe of the endless vistas and set pieces tying the levels together. There’s been a clearly huge amount of resources put into animating Lara’s hair and facial expressions, even if her commercial-ready ‘do stands out when she’s otherwise covered in dirt and blood. Whether you’re playing primarily for the exploration, the puzzles, or the combat, Shadow of the Tomb Raider delivers on all fronts - with a new scalable difficulty setting for all three areas of gameplay. 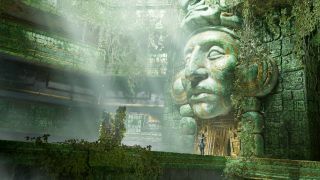 If you want to rush through Trinity’s goons and spend your time mulling over physics-based puzzles in a lost Peruvian city, or master your gunplay without having to figure out the route ahead, you’re in full control of how much assistance Shadow of the Tomb Raider gives you, if any. The puzzles in Shadow of the Tomb Raider are as smart as ever, and the interlocking parts of each mechanical chamber are satisfying to navigate even if you’re playing through with full ‘white ledge’ signposting showing you where to go. Lara will occasionally mutter the aim of each chamber if you’re having trouble figuring it out, while on the right difficulty her ‘survival instincts’ will highlight important objects for the task ahead. It means you’re never dumped in a chamber with no explanation or support, while never feeling like it’s spoonfeeding you, either. Challenge Tombs return in style, with plenty of optional areas scattered throughout the game. You’ll often have to go out of your way to find them, but they offer some suitably challenging puzzles and breathtaking level design, all while expanding the mythology and scale of the world you’re in. When it comes to exploration, there’s plenty of variety to keep you busy. The setting is somewhat… warmer than Rise of the Tomb Raider’s trek through Siberia. Shadow of the Tomb Raider is more concerned with volcanos and jungles than frozen wastes, and the result is a lush environment teeming with life, from birds and croaking frogs to the game’s populated city hubs, full of people going about their days. There are plenty of side missions and collection quests as usual, which – like the Challenge Tombs – remain optional, and can either flesh out the story as you go or add an incentive to retread old areas after you’ve finished the bulk of the game. Those challenge tombs know how to set the scene. There are also two key dimensions added to traversal in the game. The first is underwater, with flooded passageways and caverns proving unexpectedly nail-biting – Lara can only hold her breath for so long, and attempting to dodge piranhas while occasionally popping up for air led to some of the game’s tensest moments. The second is your grappling rope. In addition to clambering over cliff faces with your trusty climbing axe, you can now rappel down into caverns and swing on ropes to get across platforms. It adds a whole new verticality to the platforming, and throwing your grappling hook mid-air in the Peruvian jungle feels thrilling, if a bit imprecise at times. In true Mayan apocalypse style, you’ll be trying to find your feet against a backdrop of floods, earthquakes, and cataclysms, and the game’s real highlights are when the ground is literally breaking beneath you, forcing you into rapid jumps and movements without the luxury of forethought. One thing that really marked out the 2013 Tomb Raider reboot was seeing Lara Croft not as a badass action hero, but a resilient survivor in the face of both natural and supernatural danger. By the time you’ve got to Shadow of the Tomb Raider, you know your way around a weapon, but there’s still a terse sense of danger around what the jungle may hold. Whether you’re fighting off jaguars or giant eels – or other chilling enemies we won’t spoil for you – the game uses suspense masterfully, giving Lara a brief glimpse of her foes in the distance often long before you face them in combat, often with no indicator of when that will be. Lara is clearly a survivor, but the game is careful never to let you feel too in control of any situation. Ledges are just at the limit of your reach, ladders break apart in your hands, and each combat encounter feels like a near brush with death. Lara is hanging on by her fingernails – often literally – and the game’s snake pits, spear traps, and flooded passageways are always eager to remind you of that. Developer duties for Shadow of the Tomb Raider were somewhat shared between Crystal Dynamics and Eidos Montreal – the latter bringing their more stealth-focused experience from games like 2014’s Thief or the recent Deus Ex games to bear. And the new influences are clear, while still feeling like the same Lara from previous games. The slow-moving stealth sections offer a welcome break from more high-octane gameplay, with more in common with Predator or Rambo than the Indiana Jones films that Tomb Raider is so clearly in debt to. You’ll be plastering yourself in mud to scurry around undetected, and only a certain amount of bloodletting is mandatory – though taking out every enemy one-by-one is still the simplest way to get through any level. Shadow of the Tomb Raider tries to interrogate the game’s violence, with Lara often reminded of her own rising bodycount even as she tries to save others from execution at the hands of Trinity’s cultists. As the game progresses, however, the odd disjunct between gunning down henchmen and softly weeping about it at your campsite gets more and more pronounced. For all its interlocking puzzles and smart platforming, this is an action game, and it’s prone to leaning on generic gunplay for the story’s key pressure points and boss fights. In developing Shadow of the Tomb Raider, Crystal Dynamics and Eidos Montreal certainly haven’t been deaf to the usual criticisms of Tomb Raider’s tokenistic use of ‘exotic’ environments as a backdrop for white adventurers, traditionally left in even more ruins by players’ run-and-gun through centuries’ old tombs and crypts. In Shadow of the Tomb Raider, characters openly criticize your disregard for sacred tombs and objects, while there are some unintended consequences to Lara’s dogged pursuit of one particular Mayan artifact early in the game. This is a Tomb Raider entry that looks critically at the tropes of its franchise, and there is a seed of something quite radical in it, even if it prefers to point out something problematic rather than actually fix it (one scene that literally sees Lara worshipped by 'savages' somehow managed to make the cut). The rebooted trilogy has however clearly attempted to engage more with the cultures and people Lara visits, with a dedicated team of cultural consultants in development – even if the educational value of collectible artifacts and Mayan monoliths are geared towards completionists rather than budding historians. Alongside the usual language and subtitling options, players can also now switch in an ‘Immersion Mode’, where background characters speak in their native tongue instead of your own preset language. And the care put into the bustle of a small market town in Peru, or the wandering inhabitants of a lost Mayan city, ensures a more thoughtful awareness of the cultures you stumble upon, with missions that make you engage with the inhabitants instead of just running-and-gunning past them. All the signs point to a franchise that is growing alongside its lead character – Shadow of the Tomb Raider is perhaps the most mature entry in the series, and one that doesn’t forget to make a thrilling and varied blockbuster game in the process. Shadow of the Tomb Raider marks the end of a worthy trilogy, one that put in the hard graft to develop Lara’s character and emotional journey, against the usual confines of an AAA action game. It interrogates the series’ legacy perhaps more than any other instalment, even if it doesn’t have the resolve to answer all of the difficult questions it raises. The main story can be bashed through in around 12 hours, if you’re not stopping to pick flowers or check out the challenge tombs and side missions along the way – but that’s only about half of the content on offer. There’s plenty of motivation for retreading previously explored areas with your late-game equipment and abilities, and the Challenge Tombs are satisfying additions to the main meat of the game (with another seven available for those who invest in the game’s Season Pass DLC). The platforming and traversal mechanics here are really spectacular, while the customizable difficulty settings make this a truly accessible entry point for the series – even if we recommend playing through the whole trilogy to get the best sense of where Lara Croft has come from. Shadow of the Tomb Raider is available on PS4, Xbox One, and PC.